In this section, you will learn how to create a basic Test Plan to test an LDAP server. As the Extended LDAP Sampler is highly configurable, this also means that it takes some time to build a correct testplan. You can however tune it exactly up to your needs. This example assumes that the LDAP Server is available at ldap.test.com. For the less experienced LDAP users, I build a small LDAP tutorial which shortly explains the several LDAP operations that can be used in building a complex testplan. Take care when using LDAP special characters in the distinguished name, in that case (e.g. you want to use a + sign in a distinguished name) you need to escape the character by adding an "\" sign before that character. Extra exception: if you want to add a \ character in a distinguished name (in an add or rename operation), you need to use 4 backslashes. Go ahead and add the Thread Group element by first selecting the Test Plan, clicking your right mouse button to get the Add menu, and then select Add→Threads (Users)→Thread Group. You should now see the Thread Group element under Test Plan. If you do not see the element, then "expand" the Test Plan tree by clicking on the Test Plan element. Begin by selecting the LDAP Ext Users element. Click your right mouse button to get the Add menu, and then select Add→Config Element→LDAP Extended Request Defaults. Then, select this new element to view its Control Panel. Like most JMeter elements, the LDAP Extended Request Defaults Control Panel has a name field that you can modify. In this example, leave this field with the default value. For each of the different operations, some default values can be filled in. In All cases, when a default is filled in, this is used for the LDAP extended requests. For each request, you can override the defaults by filling in the values in the LDAP extended request sampler. When no value is entered which is necessary for a test, the test will fail in an unpredictable way! We will not enter any default values here, as we will build a very small testplan, so we will explain all the different fields when we add the LDAP Extended samplers. In our Test Plan, we want to use all 9 LDAP requests. Adding the LDAP Extended Request to the LDAP Ext Users element (Add→ Sampler→LDAP Ext Request). Then, select the LDAP Ext Request element in the tree and edit the following properties. Rename the element: "1. Thread bind"
Select the "Thread bind" button. (Optional) Enter the baseDN in the DN field, this baseDN will be used as the starting point for searches, add, deletes, etc. take care that this must be the uppermost shared level for all your request, e.g. when all information is stored under ou=Users, dc=test, dc=com, you can use this value in the basedn. (Optional) Enter the distinguished name from the user you want to use for authentication. When this field is kept empty, an anonymous bind will be established. (Optional) Enter the password for the user you want to authenticate with, an empty password will also lead to an anonymous bind. Rename the element: "2. Search Test"
Select the "Search Test" button. (Optional) enter the searchbase under which you want to perform the search, relative to the basedn, used in the thread bind request. only the given searchbase is used, only for checking attributes or existence. (Optional) Time limit, specifies the maximum number of milliseconds, the SERVER can use for performing the search. It is NOT the maximum time the application will wait. When a very large returnset is returned, from a very fast server, over a very slow line, you may have to wait for ages for the completion of the search request, but this parameter will not influence this. Leave empty (the default setting must also be empty) This will return all attributes. (Optional) Return object. Checked will return all java-object attributes, it will add these to the requested attributes, as specified above. Unchecked will mean no java-object attributes will be returned. (Optional) Dereference aliases. Checked will mean it will follow references, Unchecked says it will not. (Optional) Parse the search results?. Checked will mean it gets all results in response data, Unchecked says it will not. Rename the element: "3. Compare Test"
enter the entryname form the object on which you want the compare operation to work, relative to the basedn, e.g. "cn=jdoe,ou=Users"
Enter the compare filter, this must be in the form "attribute=value", e.g. "mail=jdoe@test.com"
Rename the element: "4. Single bind/unbind Test"
Select the "Single bind/unbind" button. Enter the FULL distinguished name from the user you want to use for authentication. E.g. cn=jdoe,ou=Users,dc=test,dc=com When this field is kept empty, an anonymous bind will be established. Enter the password for the user you want to authenticate with, an empty password will also lead to an anonymous bind. Take care: This single bind/unbind is in reality two separate operations but cannot easily be split! Rename the element: "5. Add Test"
Enter the distinguished name for the object to add, relative to the basedn. Add a line in the "add test" table, fill in the attribute and value. When you need the same attribute more than once, just add a new line, add the attribute again, and a different value. All necessary attributes and values must be specified to pass the test, see picture! (sometimes the server adds the attribute "objectClass=top", this might give a problem. Rename the element: "6. Modify Test"
Select the "Modify test" button. Enter the distinguished name for the object to modify, relative to the basedn. Add a line in the "modify test" table, with the "add" button. this will mean that the attribute value (not optional in this case) will be added to the attribute. When it is existing, and defined multi-valued, the new value is added. when it is existing, but single valued, it will fail. When it is existing, old values are removed, the new value is added. (Optional) Add more modifications in the "modify test" table. All modifications which are specified must succeed, to let the modification test pass. When one modification fails, NO modifications at all will be made and the entry will remain unchanged. Rename the element: "7. Rename entry (moddn)"
Select the "Rename Entry" button. Enter the name of the entry, relative to the baseDN, in the "old entry name"-Field. that is, if you want to rename "cn=Little John Doe,ou=Users", and you set the baseDN to "dc=test,dc=com", you need to enter "cn=John Junior Doe,ou=Users" in the old entry name-Field. Enter the new name of the entry, relative to the baseDN, in the "new distinguished name"-Field. when you also add a different subtree, e.g. you change from cn=john doe,ou=Users to cn=john doe,ou=oldusers, it will move the entry. You can also move a complete subtree (If your LDAP server supports this! ), e.g. ou=Users,ou=retired, to ou=oldusers,ou=users, this will move the complete subtree, plus all retired people in the subtree to the new place in the tree. Rename the element: "8. Delete Test"
Enter the name of the entry, relative to the baseDN, in the Delete-Field. that is, if you want to remove "cn=John Junior Doe,ou=Users,dc=test,dc=com", and you set the baseDN to "dc=test,dc=com", you need to enter "cn=John Junior Doe,ou=Users" in the Delete-field. Rename the element: "9. 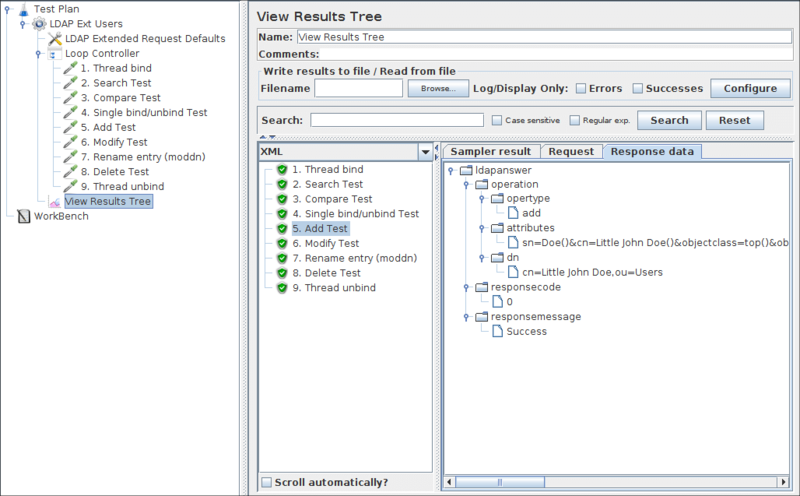 Thread unbind"
In this listener you have three tabs to view, the sampler result, the request and the response data. The request gives a short description of the request that was made, in practice no relevant information is contained here. The response data contains the full details of the sent request, as well the full details of the received answer, this is given in a (self defined) xml-style. The full description can be found here.